Being the reviewer at Out of the Gutter, I am blessed with the chance to read a lot of great books and share my opinions with all of you. The bad part of being the reviewer, is there are times when I get a lot of new books and, sad to say, some books seem to fall by the wayside. In an effort to correct this problem, I decided to dig down into my TBR pile and see if I could find any gems that may have slipped through my fingers. I am happy I made this decision, as I came across a hell of a great read that you are going to love. It has been a while since I read Matt Philips’ Redbone. I recalled really enjoying it, but I forgot what an effective writing style Philips possesses. 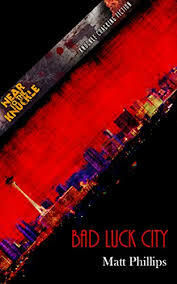 I started Bad Luck City ill prepared for the scorching read that this book presented. From beginning to end, this book did everything right. Sim Palmer is a reporter in an age in which many reporters have fallen by the wayside. He is a reporter who lives the life of a reporter; get a lead on a story, look for the juicy meat of the story and then sink your teeth into it, never relinquishing the bone until you have stripped it clean and satiated yourself. When Palmer gets a tip that a woman he has never met, Gloria, might be missing (yes, MIGHT). Palmer sinks his teeth into this lead and finds more than he could have bargained for. Despite being warned off the case in a violent attack, he searches the city streets for more leads and what he hopes will be a satisfying ending to this story. Without giving away too much of this wonderfully balanced plot, this story is at its core a story about family, having a sense of honor, and a man’s quest to find answers to both a news story and about himself at the same time. Philips used a deft touch is pulling all these pieces together in a must-read novella. I would have to compare this book to a superstar athlete. It is lean, cut in a way that makes it efficient towards its goal, and in the end, it is a winner. Phillips creates a feeling of a throwback pulp novel that rings with authenticity. This was the second book I have read by Philips and it is the second time I have been left wanting more.